In the far future there is an alien called Humphree and his best friend Cosmoe the Earth-Boy. Humphree and Cosmoe are making a mega weiner which is the size of a jeep. They have made it for the Intragalactic Food Truck Cook-OFF which is a festival where everyone makes something to eat the QUEEN will judge it. 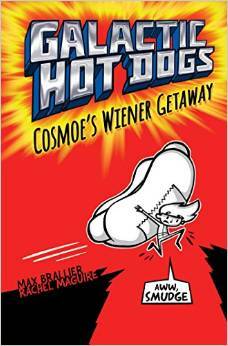 It is a large competition but Cosmoe thinks he will still win it with his wiener… Until, someone takes his mega weiner…. Cosmoe has a rubbery elastic blob that is forever wrapped around his arm and can’t leave or he will die. His name is Goober and he can turn into things. Goober lassoes the weiner thief. That’s when they realise that they have just lassoed the evil Princess Dagger. They quickly escape in their ship, the Neon Wiener. But then, they realise that Princess Dagger is on board and that the Royal Navy are after them. Soon the whole Armada (the Queen’s ship) is after them. The Queen sends a jet to unkidnap her daughter but the Princess doesn’t want to go so she attacks and kills the Jacks (they are the robots in the Navy) and has a big temper tantrum so Cosmoe lets her stay. They fly past the Navy and Armada to safety on the Interstellar Highway. NOT! Again, the Queen sends a message to all the ships to unkidnap her daughter but after a bumpy ride the Princess saves Cosmoe and Humphree with a weiner surprise. Can the Queen stop them? Does the Queen get her daughter back? If you are intrigued and want to know more, you’ll need to read the book! I really enjoyed this book and all the comics in it. I recommend this book to 8+ comic and adventure lovers.